Sunday, November 9 at 1PM BookPeople Presents The Food Network's Tyler Florence speaking & signing Inside the Test Kitchen: 120 New Recipes, Perfected Books & tickets for this event are available in-store only. Tyler Florence does updated comfort food like no one else, but comfort food’s never been updated like this. Join him as he perfects, simplifies, and totally re-invents your favorite dishes in surprising, spectacular ways. PLEASE READ: The speaking portion of this event is free and open to the public. Tickets are required to join the signing line at this event. Books & tickets are now available for purchase in-store only. If you cannot make it to the event, you can order a signed copy. Add the book to your cart and write "SIGNED COPY" in the comments field during checkout. We ship all over the world! About Inside the Test Kitchen: Have you ever wondered which cheese, exactly, will make the stretchiest, cheesiest mac and cheese? Or if you can make Hollandaise sauce without fear, a double boiler, or even a whisk? Or if, instead of having to choose between onion rings or French fries, you can make onion rings crusted with French fries? Tyler Florence has. These are the kinds of questions he obsesses over when he thinks about how to make cooking both easier and more exciting. For years, while shuttling between his restaurants and TV shoots, Tyler's kept a notebook of ideas to push his own recipes out of their comfort zone. Now, for the first time in his career, he’s established a culinary lab where he can dive deep into the hows, whys, and why-nots of his cooking. He brings you Inside the Test Kitchen to see his experiments, the wins and the fails, and of course, the delicious, foolproof, and surprising recipes that come out of it. Go from tricks to make basics brilliant—like saucing Double-Creamed Spinach with pureed spinach, or using boiling-hot brine to make a Super-Crisp Roast Chicken— to simpler ways to make the classics, like a nearly no-stir Time Saver Risotto and a Three-Minute Hollandaise, to pure reinvention, like Fronion Rings and almost-instant Modern Burger Buns. Through these 120 recipes, Tyler invites you to question culinary sacred cows, push your skills to the next level, and make food more delicious than they would have thought possible. About Tyler Florence: Tyler Florence is a Food Network star, author of twelve books, product designer, and the chef-owner of Wayfare Tavern in San Francisco and El Paseo in Mill Valley, California. He also produces wines under his California Crush label, and will open the Tyler Florence Test Kitchen, a culinary laboratory, think tank, and event space, in late 2014. He lives in California with his family. In order to have anything signed at a BookPeople event, a copy of the event book must be purchased from BookPeople. If you purchase your book from BookPeople in advance of the event, please save your receipt and present it at the event. Thank you for supporting Tyler Florence & your local independent bookstore! The speaking portion of this event is free and open to the public. Wristbands are required for the signing portion of the event and are available only with the purchase of a copy of Tyler Florence Fresh from BookPeople. We will begin distributing wristbands when we open at 9am the day of the event. You can pre-order a copy of Tyler Florence Fresh now! We are also accepting pre-orders for signed copies of the book for those who cannot attend the event. Please write "SIGNED COPY" in the comments field at checkout. Tyler turns ingredients into superstars in Tyler Florence Fresh, a new look at easy and sophisticated cuisine. Tyler Florence shows off his bold side with a celebration of fresh everyday foods prepared in innovative and delicious ways. Using each fresh ingredient as a launching pad, Tyler builds innovative dishes flavor by flavor, showing you how to put easy-to-find ingredients to work in unexpected ways. Tyler Florence is a Food Network star and one of America’s brightest culinary voices. He is the author of six cookbooks and is a regular guest on the Today show, CNN, The View, and more. He is the chef-owner of Wayfare Tavern in San Francisco; El Paseo in Mill Valley; and three outposts of Tyler Florence Wine and Rotisserie in Napa and San Francisco. Tyler Florence is currently considered a "single author." If one or more works are by a distinct, homonymous authors, go ahead and split the author. 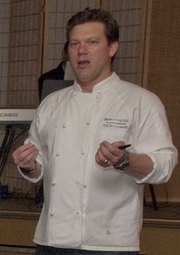 Tyler Florence is composed of 2 names. You can examine and separate out names.